“We’re safe on Mars,” said Allen Chen, an engineer in the NASA control room, inciting a room of ear-splitting cheers, hugs and handshakes. 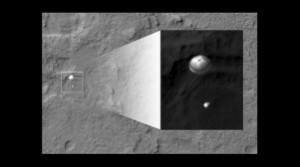 A sharp, silver object sitting atop Planet Mars, sparked the successfully landed NASA Curiosity’s own curiosity. The object is a mountain named Mount Sharp. Mars’s Mount Sharp is approximately 3.4 miles taller than Mount Whitney in California, according to Fox News. The object appears to be related to Martian life. Also according to Fox News, the NASA Curiosity project seeks hints of environmental history that the mountain could hold. Photos were released showing the NASA Curiosity space vehicle during its land onto Mars, where the rover’s shadow is visible. The NASA rover landed in a parachute. Due to this accomplished landing, the world’s questions of outer space have been turned towards NASA. According to The New York Times, the United States NASA now stands ahead of Russia, Europe and China, discarding its image of lagging. Granted NASA Curiosity weighs one ton, mission crew did not want to risk using cushions or air bags for the landing. Rather, the mission entailed carefully placing the machine onto Mars from a separate rocket surface, lingering above. This NASA mission consumed eight months, and Curiosity traveled 352 million miles before finally landing Sunday. Though no one knows when the next Mars landing will take place, NASA hopes that a discovery by Curiosity will inspire Congress and citizens to invest in further Martian investigation.